This is a real cracker! It took me a while to settle on this particular route, but so glad I did. 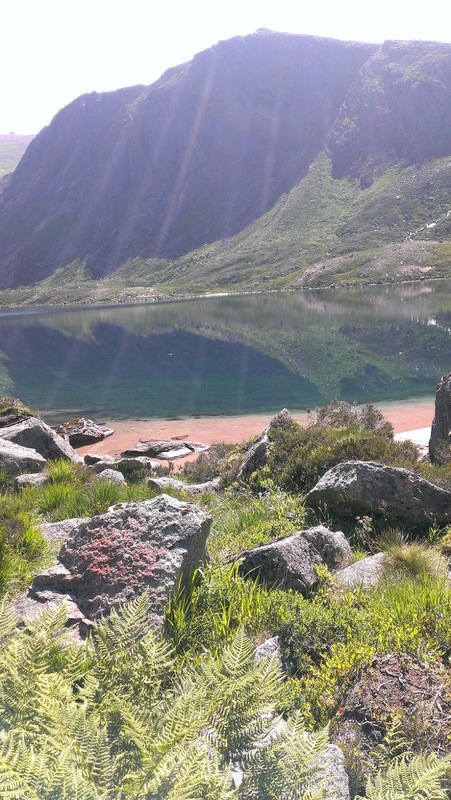 Although it takes in four Munro's, there are easier routes for bagging these (and including more) summits, but I wanted to explore beneath as well as above, especially around Loch Etchachan and Loch Avon. Oh and never have to look at any of the ski-world to the North! I also wanted to start from Linn o Dee because Glen Derry is such a nice approach into the wild. From Derry Lodge the route heads up the 100% runnable path to Derry Cairngorm, then boulder-hops to Loch Etchachan, does an out-n-back onto Beinn Mheadoin, drops to Loch Avon (which really does feel like the heart of the Cairngorms as it is often considered), before ascending steeply from there up to the plateau and Cairngorm Mountain. 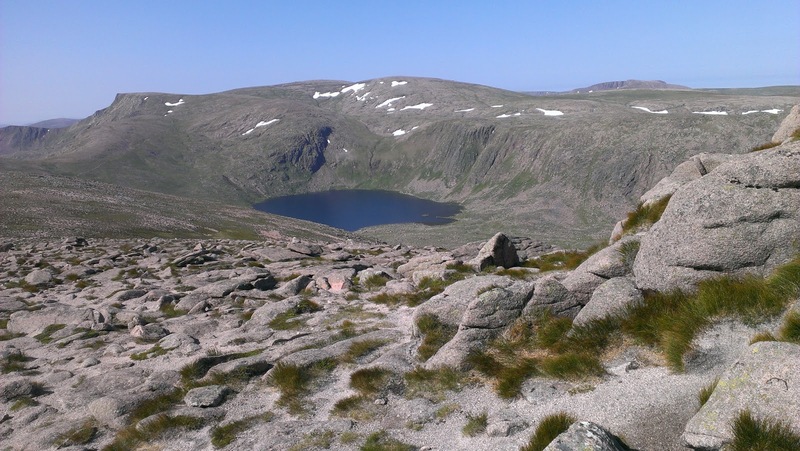 From the cairn, drop SE to "the saddle" (I descended a little down Strath Nethy for water here), then up mostly easy slopes to Bynack More on nice terrain with open views. Then after a steep descent through the heather its a mostly-downhill 10mile trail-run back to Glen Derry then Linn o Dee. Easy trail up into the blue. Smell those pines! The car park at Linn o Dee was thick with midge, so no faffing just straight on with the pack and off through the misty Caley Pine forest onto gravel road for 3miles to Derry Lodge, already there were already a fair number of munro-baggers' bikes scattered around here. My route was heading for Derry Cairngorm, so over the footbridge I went onto an excellent track through the heather and pines, quickly gaining height, soon enjoying fabulous sunshine. It was only 8:30am but already very warm above the clag, the visibility was superb, Lochnagar dominating the skyline to the E, Beinn 'a Ghlo to the SW, and once onto the ridge proper, I could admire the mouth of the Lairig Ghru with Cairn Toul's eastern corrie looking like a missing tooth. The air was scented with warm pine and heather. 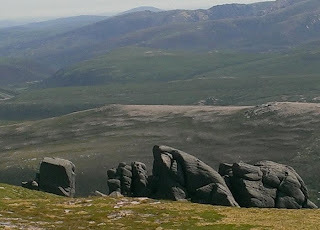 Ascending up to the bouldery summit of 'Derry is relatively gentle (surprisingly runnable) and the ridge broad, but the views down both sides are fine with the meandering river Derry in its lush glen below to the right, and the Cairngorm 'big boys' to the left. From the summit I descended the bouldery slopes N towards the 3-way-bealach above Loch Etchachan, eventually catching up with some other runners near the water - a father and his young son (about 12!?). After a brief chat, filling the bottles from the outflow of Etchachan, I ran up to the summit of Beinn Mheadhoin wondering if I'd just met a future 'Killian Jornet'! Sat on the summit tor and munched cookies in the sun. Killian and his dad weren't far behind - I met them again as I retraced my way back to the loch, then turned N to join the trail that drops down to Loch Avon and Shelter Stone. The heat was really building, and having dropped beneath some vertical rock (Shelter Stone Crag) this was really beginning to feel and smell like the Alps. Once around the N shore of Loch Avon I stopped to drink from Allt Coire Raibeirt, and eat the crisps and bread rolls that had been toasted by the sun, before proceeding on the the very steep ascent beside the "Allt", one big rocky step after the other so I don't care who you think you are there's definitely no running up here! 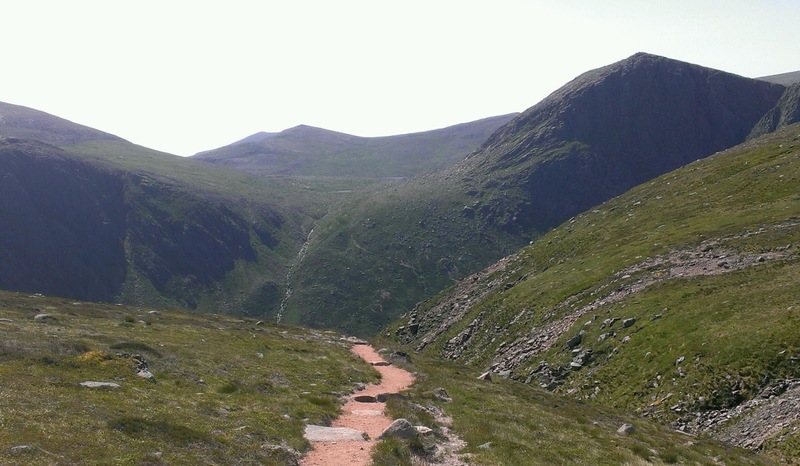 ...Until that is quite suddenly the Corrie is reached and the path transforms into a ridiculously manicured ribbon of gravel. They were still working on this and gave me a wave as I jogged past. 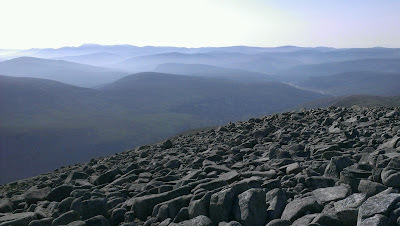 So it was time to join the crowds at the Cairngorm mountain I thought, with its road, train and ski slopes. Surprisingly there was only one couple sat at the summit cairn, but I didn't hang around anyway, heading off-trail now, E to eventually pick up a trail that would take me down between crags into Strath Nethy. Getting thirsty again, so I dropped from the watershed to where the River Nethy is born so I could refill my bottles from it, then retraced onto a gradually disappearing trail NE up the shoulder of A' Choinneach, the highlight of this being the views back over Loch Avon again - truly worthy of the label "heart of the Cairngorm". 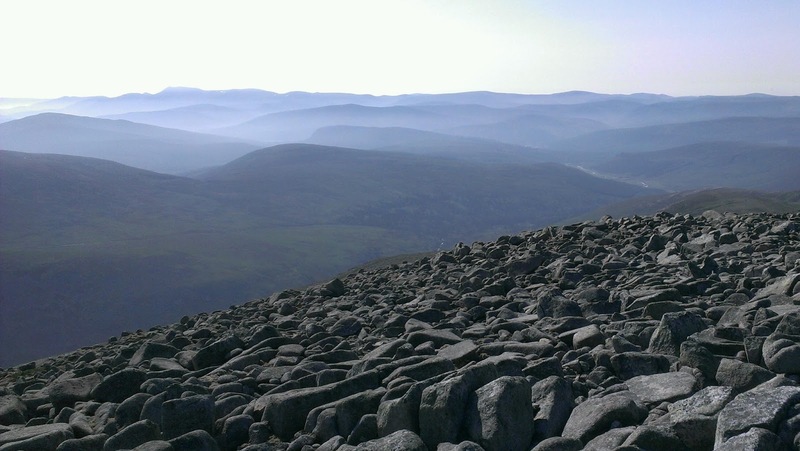 Legs getting tired so I was glad this was the last climb for me today, finishing on the summit of Bynack More with its rock "barns". Even with dead legs and thoughts dominated by pints of Guinness, these are interesting. Freaky. Two sets of them, the little brown barns on the crest, and the much bigger and totally differently grey ones down the slope a bit. The photos don't really portray the size - i.e. the little ones on the left are only about 6m high, whereas the big grey ones are about 20m. I had another sun-toasted roll with crisps at the summit then headed off-trail steeply through the thickening heather aiming for the main Glenmore-Braemar through-route known as the Lairig an Laoigh*. It was really nice (and important) to get back down to water as the temperature continued to rise into the afternoon. There wasn't much climbing left in the legs but they felt great again heading down to Glen Derry - probably because I'd stopped, eaten and drank so much. There were a few more people down the glen - all with huge grins on their faces knowing they were bloody lucky to be where they were on such a fine day. * My dad had done this a few days ago with an 80litre pack and a 72 year-old sense of adventure (a-walk-in-cairngorms). He was going to wait till the weekend when I could be around (safety-in-numbers) but the weather window earlier in the week looked too good to miss and there were no guarantees it would hold.